Omkar Realtors and Developers is a brand that embodies luxury with fine taste envisions changing the Worli skyline through its premium development Omkar 1973 Worli encompassing three skyscrapers going beyond 800 meters together. Built on a spread of 4.5 acres, this massive project is being built with the best technologies across the world and hence Omkar developers is relying on Doka’s Self Climbing Platform 400 (SCP 400), Protection screen Xclimb 60, Column climbing system SKE 50 and slab formwork Dokadek 30. Like a diamond identifiable by its unique number, the project is named 1973, which is the latitude 19 and longitude 73N - a unique aspect of its location. Each tower has been designed uniquely with a large core area in the center and approximately 19 massive sized columns surrounding the same. Columns and core wall are connected by slab casted in between. So, finding the right formwork solution was the key which would preferably allow the crews to cycle the vertical and horizontal formwork at the same speed in order to meet the tight schedule. The central core of the building is designed to be self-supporting which allows the core to proceed ahead of the slabs and columns. SCP 400 was selected for the task which offers faster cycle times and already 6days core jumping cycles have been achieved with this system. The core wall was divided into two zones, which allowed for smooth work flow of activities like rebarring, closing, pouring, stripping etc in one zone while the second zone is climbing. Moreover, system was designed such that it allowed for the adjustment required for reducing wall dimensions for both wall formwork and exterior platforms. SCP 400 provides a safe and efficient way to construct high-rise cores and has room for all of the site equipment needed and is enclosed on all sides for a safe, weather shielded working at any height. The perimeter tower columns for the tower are also critical, and require to be looked at separately. The heavily reinforced columns have been designed to stand above the slabs by 3-4 floors to allow the slabs to work without the interruption. For these columns, automatic climbing formwork SKE50 is used, which has been designed in order to accommodate the changing dimensions of column with height. Moreover large working decks have been provided on the top which allows for storage of reinforcement and ease of placing. 4 days jump cycles have already been achieved for the columns. 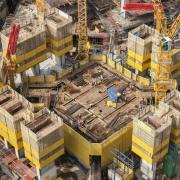 The floor slabs are the final formwork element which is critically important for accelerated construction. The speed of decking slabs defines how quick the construction proceeds. Omkar required a quick, light weight, labor efficient system to keep up with the automatic climbing systems on the cores and slabs. A drop head panel system Dokadek 30 was chosen solution, which was designed using the combination of standard panels and customized panels, in order to cover the 100% slab area without any infill zones. Moreover, for all the curved balconies with drop beam, an integrated unturned spandrel beam formwork is being used, which in turn provides a complete formwork solution for Slab and balconies and hence increase the productivity at site. 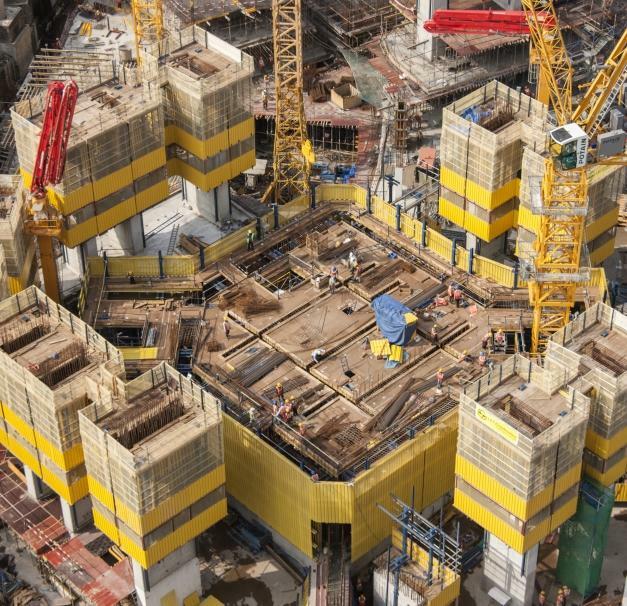 To provide protection to the tower surrounds as well as ensuring a safe working environment even at 300+m in the air, Omkar required perimeter screens to be fitted to the formwork systems. A ‘gapless’ enclosure at the top building-levels that is anchored to the structure at all times means that all work can be carried out protected from climatic influences and in the very greatest safety. The Doka Xclimb 60 protection screens were selected to cover the complicated perimeter of the towers. The protection screen’s high degree of pre-assembly simplified the planning and made for a highly economical solution. As Xclimb 60 has been fielded here as a self-climbed system, fast resetting times are possible without crane assistance. Overall, this combination of core/column/slabs and protection screen with the logistics network will enable a consistent, continuous, safe and speedy workflow. 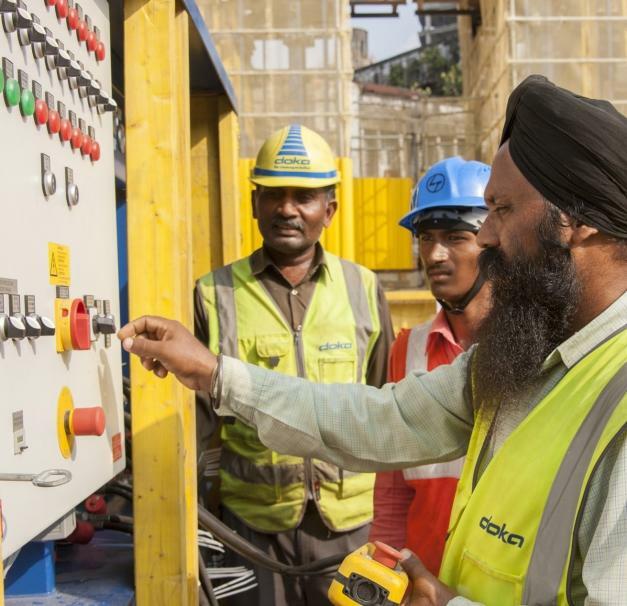 Competent technology, ease of operating and handling, high end performance and safeguarding features of all the systems will surely have a greater contribution towards a robust construction. Thank you for your interest - DOKA’s GenNext formwork technology at Omkar 1973. Thank you very much for your interest - DOKA’s GenNext formwork technology at Omkar 1973.